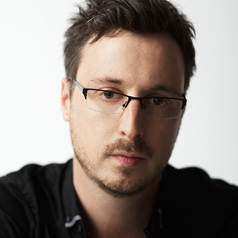 Christopher Hale is one of Australia’s most unique and respected improvising musicians, recognized as an “Australian jazz heavyweight and a brilliant, groundbreaking composer” (Rhythms Magazine). Though an accomplished performer of percussion and mandolin, he is most known as one of Australia’s foremost exponents of the bass guitar, with an approach to the six-string acoustic bass that is characterized by a complex harmonic awareness (particularly his unique chordal approach), formidable rhythmic strength and a fluid and agile melodic sensibility. He has performed throughout the world as a leader and sideman at the highest level in almost every contemporary idiom, with Gotye, Lior, Shane Nicholson, Kate Ceberano, New York based electronic outfit Sylent Running, jazz luminaries Paul Grabowsky, Jamie Oehlers, Nir Felder, Julien Wilson, Brad Shepik and vocalist Gian Slater among many others. He received an Australia Council Fellowship for work with his trio, The Christopher Hale Ensemble, and in 2012 was awarded the prestigious Freedman Fellowship for Jazz. A 20-year immersion in Flamenco has taken him to Spain and numerous tours with celebrated dance company Arte Kanela. He is a member of the Australian Art Orchestra and was the Brazilian percussion specialist for Channel 7’s Dancing with the Stars. Hale is also active as an educator and academic, lecturing at the Victorian College of the Arts, Monash University and NMIT in Melbourne and holding a Masters degree in Music, focusing on Plato’s Ion dialogue. Most recently, Hale has been performing and studying in Korea, immersing himself in the traditional drumming practices of SamulNori and the Shamans of the east coast. His fourth album as leader, Sylvan Coda, featuring Gian and Nathan Slater and Flamenco dancer/percussionist Johnny Tedesco, was released in August 2012 to critical acclaim, including an AIR nomination for best jazz release.